Utilizing Bio-Technology we can provide your fish with a nutritional package that will have them looking like they just came off the reef. You can expect those rich, brilliant colors you bought your marine fish for. Excellent for fish larger than 10 cm (4 inches) in length. Feed no more than your pet will consume within two minutes two to three times each day based on size. 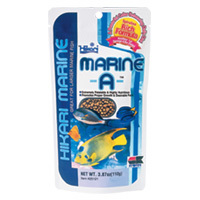 As Hikari Tropical Marine-A is a very powerful food, care should be taken to avoid over-feeding and always remove uneaten food after feeding period.